Head and neck cancer is the sixth most common human cancer, representing 3% of all types of cancer. They are located in the oral cavity in 48% of cases and 90% of these are oral squamous cell carcinoma. Important risk factors related to the carcinoma itself that are associated with a poor prognosis include large size of the tumor at the time of diagnosis, the presence of metastases in regional lymph nodes, and a deep invasive front of the tumor. Leukoplakia and oral submucous fibrosis (OSMF) are the most common potentially malignant disorders of the oral mucosa. Studies revealed that many oral carcinomas develop from these common oral potentially malignant disorders (OPMDs) of the oral cavity. To prevent the malignant transformation of these potentially malignant disorders, multiple screening and detection techniques are used. The early detection of cancer is of critical importance because survival rate is markedly improved when the oral lesion is identified at an early stage. Ezrin, a membrane-cytoskeleton linker protein, participates in many physiological functions that includes cell survival, cell motility, extracellular matrix interactions, cell–cell communication, apoptosis, and signal transduction., Recent studies have revealed that ezrin may have an important role in tumorogenesis, development, invasion, and metastasis, probably through regulation of adhesion molecules, participation in signal transduction, and signalling to other cell membrane channels in the tumor. Overexpression of ezrin is correlated with the metastatic potential and poor prognosis of various tumors. The aim of the current study is to evaluate the expression of ezrin in OPMDs including oral submucous fibrosis with different grades and clinically leukoplakia (hyperkeratosis with various degree of dysplasia). The expression of ezrin which is a marker of invasion might help to identify patients vulnerable to malignant transformation. The study material consists of 43 formalin-fixed paraffin-embedded samples of OPMDs. The tissue samples were retrieved from the archives of the Department of Oral and Maxillofacial Pathology, between the years 2010 and 2014. The specimens were selected after re-confirmation of the diagnosis on histopathological examination. Histopathologically confirmed cases of hyperkeratosis with different grades of dysplasia (clinically leukoplakia) and oral submucous fibrosis with different stages were included in the study. All the selected cases were subjected to immunohistochemical analysis for ezrin along with positive procedure controls. The antibodies and reagents used for immunohistochemical analysis were obtained from Abcam and Leica Microsystems, New Castle, United Kingdom. The primary antibody was Monoclonal Mouse Anti-ezrin 3C12 antibody in liquid form, and the secondary antibody was Novolink Mini Polymer Detection System (RE7290-K) containing Peroxidase Block, Protein Block, Post Primary Block, Novolink Polymer, DAB chromogen, Novolink DAB substrate buffer, and hematoxylin. The sections were de-waxed using xylene and hydrated through two changes of graded alcohol (100% and 90%) 5 min each. Antigen retrieval was done using pressure cooker method. Sections were immersed in 0.01 ml sodium citrate buffer at the pH of 6.0 and boiled for 3 min in a 5 L stainless steel pressure cooker. The pressure cooker was allowed to cool down to room temperature with the slides remaining in the buffer itself for 15–20 min. Slides were allowed to cool down in the citrate buffer till the pressure on the lid came down completely and then were washed in distilled water. Tris buffer saline (TBS) at the pH of 7.6 was used as immunohistochemistry wash buffer. Sections were incubated with peroxide block for 5 min. Wash sections in TBS for 1 × 5 min. Incubate with protein block for 5 min. Wash in TBS for 2 × 5 min. Incubate with primary antibody for 30 min. Wash in TBS for 2 × 5 min. Incubate with postprimary block for 30 min. Wash in TBS for 2 × 5 min. Incubate with NovoLink™ Polymer for 30 min. Wash in TBS for 2 × 5 min. Develop peroxidase activity with DAB working solution for 5 min (Prepare DAB working solution by adding 50ul of DAB chromogen to 1 ml of DAB buffer). Rinse slides in running water. Counterstain with hematoxylin. Rinse slides in water for 5 min. Dehydrate, clear, and mount sections with DPX. 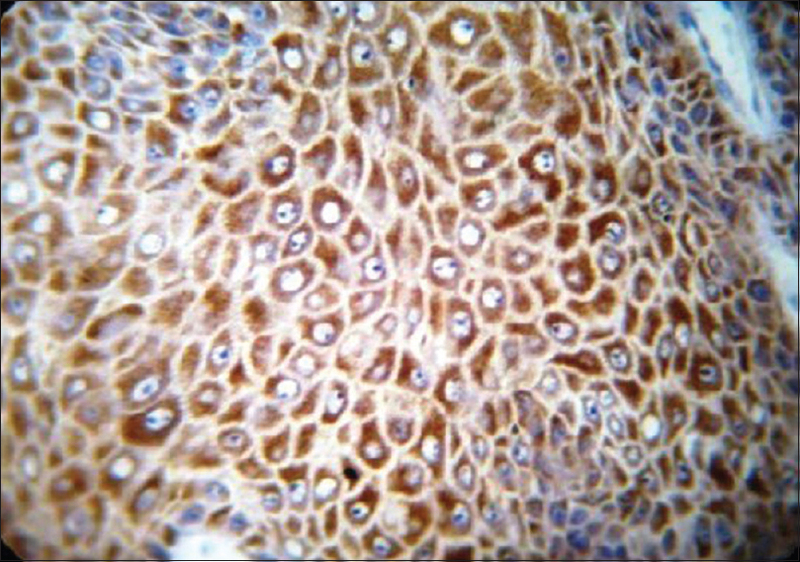 Immunohistochemical staining of ezrin was done, and the localization, intensity, and the proportionality of staining were determined both in the epithelium and in the connective tissue. The staining characteristics were observed semi-quantitatively by two independent observers and were assessed from three fields. A scale of − to +++ was used. The grading was based on the intensity of the stain and the area of positive staining. Descriptive statistics such as mean, median, and its 95% confidence interval (CI) were calculated. 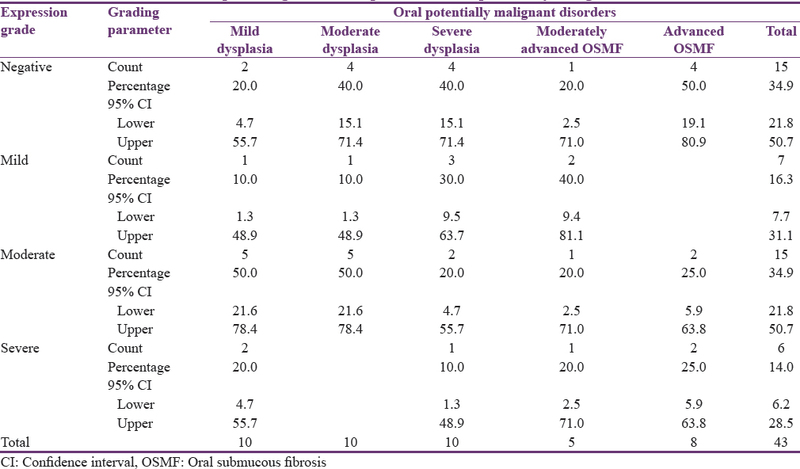 A total of 43 cases of OPMDs including OSMF with different grades and clinically leukoplakia (hyperkeratosis with various degrees of dysplasia) were evaluated for ezrin expression. [Table 1] summarizes the mean, median, and standard deviation (SD) value of ezrin expression in OPMDs. The mean value is 2.23 with 95% CI: 1.67–2.79 and SD of 1.875. The median value is 2.00 with 1st quartile 0.00 and 3rd Quartile 4.00. 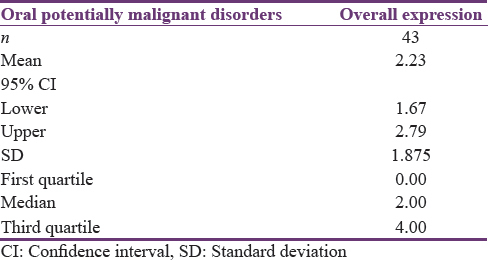 [Table 2] summarizes the overall intensity index and proportionality index of ezrin expression in OPMDs and its descriptive statistics. 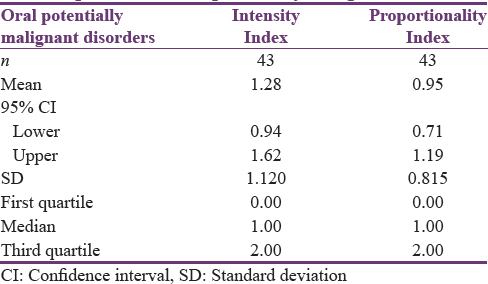 The mean value of intensity index is 1.28 with 95% CI: 0.94–1.62 and SD of 1.120. The median value is 1.00 with 1st Quartile 0.00 and 3rd Quartile 2.00. The mean value of proportionality index is 0.95 with 95% CI: 0.71–1.19 and SD of 0.815. The median value is 1.00 with 1st quartile 0.00 and 3rd quartile 2. [Table 3] summarizes the expression of ezrin in percentage with 95% CI. Ezrin expression was found to be negative in 34.9% of cases with 95% CI: 21.8–50.7. Mild expression of ezrin was found to be 16.3% with 95% CI: 7.7–31.1. Moderate expression of ezrin was found to be 34.9% with 95% CI: 21.8–50.7. Severe expression of ezrin was found to be 14.0% with 95% CI: 6.2–28.5. [Table 4] summarizes the staining location of ezrin in percentage and its 95% CI. Ezrin expression was found to be membranous in 67.9% of cases with 95% CI: 48.0–82.8. Membranous and cytoplasmic expression in 28.5% of cases with 95% CI: 14.5–48.4 and cytoplasmic in 3.6% of cases with 95% CI: 0.5–22.9. Many oral squamous cell carcinomas are preceded by clinically evident OPMDs. It is very important to prevent a malignant change in people diagnosed with OPMDs, but the hazard ratios of various OPMDs are not well known. The OPMDs include hyperkeratosis with epithelial dysplasia and OSMF. The malignant transformation rates of OPMDs show a great variation and it is difficult to determine the frequency of OPMD transforming to cancer based on the clinical and histological factors. New approaches, such as interventions with molecular-targeted agents in high-risk individuals, are undoubtedly the need of the hour to mitigate the devastating worldwide consequences of oral malignancy. Ezrin belongs to the ERM family of proteins which plays a positive role in maintaining cell shape and cell polarity as well as in membrane trafficking pathways, cell migration, cell signaling, growth regulation, and differentiation. Due to its unique function, ezrin is also actively involved in the biology of tumor development. Aberrant expression of ezrin is well correlated with poor survival in tumors including head and neck squamous cell carcinoma, osteosarcomas, cervical carcinoma, breast carcinoma, and prostatic carcinomas. Exhaustive literature search suggests that the present study is the first attempt to determine the expression of ezrin in OPMDs, namely, OSMF with different grades and clinically leukoplakia (hyperkeratosis with various degree of dysplasia). Among the cases of OPMDs, the pattern of ezrin expression was found to be predominantly membranous in 67.9% of cases and cytoplasmic in 3.6% of cases [Figure 1] and both membranous and cytoplasmic in 28.5% of cases [Figure 2]. The results are in accordance with the study conducted by Ling et al., who found the expression of ezrin seems to show increased cytoplasmic staining in dysplastic and esophageal squamous cell carcinoma in contrast to normal esophageal mucosa and hyperplasias. The possible reason could be that certain circumstances can stimulate the translocation of ezrin, and there is evidence suggesting that the subcellular redistribution of ezrin significantly correlates with tumorigenesis., Darwish et al. state that loss of membranous localization and cytoplasmic accumulation are fundamental in keratinocyte transformation. Gamei et al. explained the reason for the cytoplasmic shift could be attributed to decrease on activating signals or increase of inactivating signals. During the transformation from benign cell to malignant cell, the location of ezrin protein also changed, and it was distributed in the cytoplasm of malignant tumor. This transformation may weaken intercellular adhesion of normal cells and enhance the adhesion between tumor cells and normal cells, which promote tumor metastasis. According to the author Zhai et al., the activation of Rac 1 pathway by ezrin causes hepatocyte growth factor to induce tyrosine phosphorylation of E-catenin and X-catenin, inhibits the function of E-cadherin, and leads to redistribution of E cadherin in cytoplasm and on cell membrane. The pattern of ezrin expression was found to be membranous in the spinous layer of the epithelium in 17.8% of cases and in the superficial layer in 7.14% of cases. The finding well correlated to the study by Madan et al., who observed that ezrin normally localizes to the membrane in nonproliferating squamous cells. The present study reveals that 20.05% cases of leukoplakia with membranous and cytoplasmic ezrin expression were confined to the basal layer of the epithelium. The shift in localization of ezrin from membranous to cytoplasm in the basal layer of the epithelium could be attributed to the potentially malignant transformation of the basal cells. Saito et al. indicate that ezrin could enhance the growth of cancer cells by supporting cell division and cell cycle progression from G0/G1 to the S and G2/M phases. The cell cycle analysis revealed that ezrin depletion increased the G0/G1 fraction but decreased the G2-M fraction by interfering with cell mitosis and cell cycle progression. Ezrin can also support the survival of tumor cells by activating the antiapoptotic pathways. Phosphorylation of ezrin at its tyrosine residues activates the PI3-kinase/Akt pathway, thereby prevents apoptosis of tumor cells. Schlecht et al. observed that high cytoplasmic ezrin expression indicates the altered expression of antiapoptotic genes (BIRC2, CCDC50, and TGM2) and proapoptotic genes (EDARADD), resulting in survival rather than cell death. Thus, the above findings signify the role of ezrin in tumorigenesis by its cell proliferative and antiapoptotic activity. The present study also reveals that 3.6% of advanced OSMF shows only cytoplasmic pattern of ezrin expression. The above finding was supported by Zeng et al., who observed that, in low-grade dysplasia, ezrin expression seems to be membranous whereas, in advanced dysplastic conditions, ezrin expression was found to be predominantly cytoplasmic which could be equated with the invasiveness of the tumor in later stages. He also stated that the shift in localization of ezrin from membrane to cytoplasm is seen in the development of early squamous cell carcinomas. This would imply that ezrin not only acts as a linker protein but also involves in cytoskeletal reorganization and cell differentiation. Ling et al. state that ezrin mediates aberrant linkage of the cytoskeleton to various proteins, including CD44 and LAMP-1, inducing marked changes in the general framework of cellular function. This also leads to aberrant engagement with the extracellular microenvironment that is directly involved in metastatic behavior of tumor cells. The cytoplasmic expression of ezrin helps in understanding the various biological behaviors of the neoplastic cells such as tumorigenesis, cell motility, and invasiveness. Xie et al. observed in his studies state that ezrin regulates the growth and invasiveness of cancer cells through regulating the MAPK and TGF-β pathways. In TGF-β pathway, ezrin might bind to Smad2/3 and then affect the activity of the pathway. Ezrin phosphorylates the ERK protein in MAPK pathway and thereby regulates the growth and invasiveness of the tumor cells. This was confirmed by studies on cell migration assay that reveals knockdown of ezrin led to decreased migration and hence decreased invasiveness of the cancer cells. From the existing literature, it has been known that the cytoplasmic positivity of ezrin has been linked to its invasive potential in various squamous cell carcinomas. In the present study, some of the mild dysplasia cases showed cytoplasmic shift of ezrin expression that might probably represent an increased potential for malignant transformation of these cases. This finding further supports the fact that the grading of dysplasia does not always correlate to its malignant transformation potential. The study also reveals negative ezrin expression in 34.9% of cases. Gao et al. explain that the reason for decreased or negative expression of ezrin in certain dysplastic conditions was not clear which could be explained by a study on ezrin mRNA level by reverse-transcriptase-polymerase chain reaction (RT-PCR) and to determine the role of mRNA level and its interaction with upstream regulators and promoters modulating the ezrin expression. Zeng et al. explain that ezrin downregulation in tumor cells can be explained partly by a corresponding alteration on the mRNA level, as shown by RT-PCR. This study is a maiden attempt to assess the pattern of ezrin expression in OPMDs, namely, OSMF with different grades and clinically leukoplakia (hyperkeratosis with various degree of dysplasia). In our study, we observed a shift of ezrin expression from membrane to cytoplasm in 28.5% of cases which render us in profiling the malignant transformation potential of OPMDs. Thus, ezrin is a promising marker that could be used to assess the high-risk patients in earlier stages and necessitates the periodic follow-up and proper treatment planning for better prognosis of the patients. In the cell membrane, ezrin plays a role in cell adhesion whereas its cytoplasmic localization might confer a cell with migratory properties. This might act as a prognostic marker in predicting malignant transformation of OPMDs. Tanaka T, Tanaka M, Tanaka T. Oral carcinogenesis and oral cancer chemoprevention: A review. Patholog Res Int 2011;2011:431246. Turunen O, Wahlström T, Vaheri A. Ezrin has a COOH-terminal actin-binding site that is conserved in the ezrin protein family. J Cell Biol 1994;126:1445-53. Xie J-J, Zhang F-R, Tao L-H, et al. Expression of Ezrin in Human Embryonic, Fetal, and Normal Adult Tissues. Journal of Histochemistry and Cytochemistry. 2011;59:1001-8. Han K, Qi W, Gan Z, Shen Z, Yao Y, Min D, et al. Prognostic value of ezrin in solid tumors: A meta-analysis of the literature. PLoS One 2013;8:e68527. Ho PS, Chen PL, Warnakulasuriya S, Shieh TY, Chen YK, Huang IY. Malignant transformation of oral potentially malignant disorders in males: A retrospective cohort study. BMC Cancer 2009;9:260. Tanaka T, Ishigamori R. Understanding carcinogenesis for fight ing oral cancer. J Oncol 2011;2011:603740. Xie JJ, Xu LY, Wu ZY, Zhao Q, Xu XE, Wu JY, et al. Prognostic implication of ezrin expression in esophageal squamous cell carcinoma. J Surg Oncol 2011;104:538-43. Saito S, Yamamoto H, Mukaisho K, Sato S, Higo T, Hattori T, et al. Mechanisms underlying cancer progression caused by ezrin overexpression in tongue squamous cell carcinoma. PLoS One 2013;8:e54881. Ling ZQ, Mukaisho K, Yamamoto H, Chen KH, Asano S, Araki Y, et al. Initiation of malignancy by duodenal contents reflux and the role of ezrin in developing esophageal squamous cell carcinoma. Cancer Sci 2010;101:624-30. Tokunou M, Niki T, Saitoh Y, Imamura H, Sakamoto M, Hirohashi S, et al. Altered expression of the ERM proteins in lung adenocarcinoma. Lab Invest 2000;80:1643-50. Moilanen J, Lassus H, Leminen A, Vaheri A, Bützow R, Carpén O, et al. Ezrin immunoreactivity in relation to survival in serous ovarian carcinoma patients. Gynecol Oncol 2003;90:273-81. Darwish AM, et al. The prognostic values of the immunohistochemical expression of ezrin and large safety margins in basal cell carcinoma of the face. Egypt J PlastReconstr Surg 2011;35:245-51. Gamei MM, Abd el Naby NM, El-Ashmawy AA, Shareef MM. Prognostic value of ezrin expression in common epithelial tumors: An immunohistochemical study. J Microsc Ultrastruct 2014;2:67-76. Wang DS, Pan CC, Lai HC, Huang JM. Expression of HMGA1 and ezrin in laryngeal squamous cell carcinoma. Acta Otolaryngol 2013;133:626-32. Zhai JW, Yang XG, Yang FS, Hu JG, Hua WX. Expression and clinical significance of ezrin and E-cadherin in esophageal squamous cell carcinoma. Chin J Cancer 2010;29:317-20. Madan R, Brandwein-Gensler M, Schlecht NF, Elias K, Gorbovitsky E, Belbin TJ, et al. Differential tissue and subcellular expressionof ERM proteins in normal and malignant tissues: Cytoplasmic ezrin expression has prognostic significance for head and neck squamous cell carcinoma. Head Neck 2006;28:1018-27. Schlecht NF, Brandwein-Gensler M, Smith RV, Kawachi N, Broughel D, Lin J, et al. Cytoplasmic ezrin and moesin correlate with poor survival in head and neck squamous cell carcinoma. Head Neck Pathol 2012;6:232-43. Zeng H, Xu L, Xiao D, Zhang H, Wu X, Zheng R, et al. 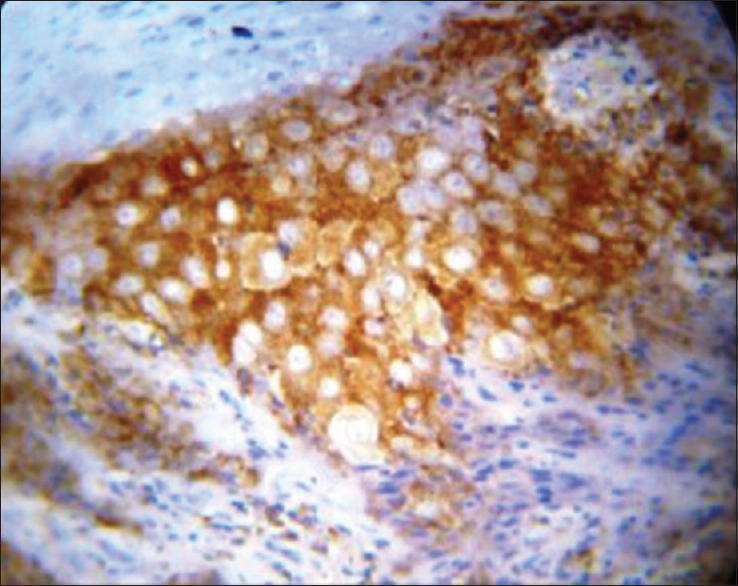 Altered expression of ezrin in esophageal squamous cell carcinoma. J Histochem Cytochem 2006;54:889-96. Xie JJ, Xu LY, Xie YM, Zhang HH, Cai WJ, Zhou F, et al. Roles of ezrin in the growth and invasiveness of esophageal squamous carcinoma cells. Int J Cancer 2009;124:2549-58. Gao W, Zhang C, Feng Y, Chen G, Wen S, Huangfu H, et al. Fascin-1, ezrin and paxillin contribute to the malignant progression and are predictors of clinical prognosis in laryngeal squamous cell carcinoma. PLoS One 2012;7:e50710.